Whoever thinks that Ayurveda is only for adults got that wrong. Whether nutrition, massage or sounds, there are many ways in which you as a parent, grandparent, aunt, uncle, etc. can lovingly support the development of young ones, from babies to teenagers! Dr. med. Jasmin Blumenberg, a paediatrician and Ayurveda doctor, will show you how. She is a board member of the Deutsche Gesellschaft für Ayurveda [German Society for Ayurveda], the oldest Ayurvedic Doctors’ Association in Germany (founded in 1983). Dr. med. Jasmin Blumenberg practices at the children’s clinic in the town of Minden and is a lecturer at the German Ayurveda Academy in Regensburg. Children need routine and rhythm for healthy development. Ayurveda and Western medicine absolutely agree on this because without a regular routine, children have difficulties handling the flood of stimuli in their lives. Common consequences are restlessness, hyperactivity and anxiety. The children can’t find balance. From the point of view of Ayurveda, this is an expression of too much Vata. An ayurvedic approach to establishing a daily routine, one that creates balance, can help restore order among the doshas or maintain dosha balance in the first place. You can start establishing a daily ayurvedic routine for children who already sleep through the night, meaning they have a regular day/night rhythm. This is usually the case from ages 2 to 3. From an ayurvedic point of view, the day should begin early – ideally at 6 a.m. Since young children are often “early risers” anyway, this will be relatively easy. It will be much more difficult with teenagers whose sleep rhythm is increasingly delayed. But it also applies to them: a regular daily routine with an early wake-up time improves their dosha balance and gives them stability for everyday life. After a sleepless or bad night – which tends to happen with small children – parents and children should, of course, sleep longer. In this case, everyone needs to find their own approach that is good for them. The same also applies for bedtime. Children and adults alike should go to bed at a set bedtime, if possible. For teenagers, this should not be after 10 p.m.; although, if they go to a party, it can be later, of course. Anyone who drinks a glass of water on an empty stomach first thing in the morning has already done a lot for themselves. From an ayurvedic point of view, drinking water helps with inner cleansing and stimulates morning bowel movements. In the case of children, you can apply this recommendation starting at age one. Ideally, for your “morning drink,” use water that has boiled for 10 minutes and then cooled to room temperature. You can also keep the boiled water in a thermos and let it cool down to the desired temperature if required. For children who are used to drinking fruit juice and are not ready to drink still water, you can slowly reduce the ratio of juice. In any case, children under 4 years of age should drink as little fruit juice as possible. It helps protect their teeth. Still water is an ideal daily thirst quencher for children. Fruit juices should be reserved for special occasions. You as a parent or other close adult can, of course, improve a child’s acceptance of water by drinking it yourself. Inner cleansing: Make sure your child takes the time to empty its bladder and bowel. Abhyanga: For babies, the morning whole-body massage is carried out by parents or another adult. Gently rub the little ones with ripened sesame oil for approx. 10 to 15 minutes. Older children (as of approx. 8 years of age) and teenagers can do the massage themselves and use a massage oil suited to their dosha type: (Vata Massage Oil for dry to normal skin, Pitta Massage Oil for sensitive skin types and Kapha Massage Oil for oily skin to skin that tends to develop blemishes) – each diluted with sesame oil, if necessary. Stretching: For infants and young children, you can gently bring their legs back and over their head during the morning massage. Then bring their right arm towards their left leg and vice versa. Not only is this fun for young ones, it is simply good for them. Body cleansing: After the massage, shower your child. While for young children pure water is often enough, older children and teenagers can use a shower gel or shampoo appropriate to their dosha type. Cleaning the tongue and teeth: Besides brushing their teeth as usual, a tongue cleaner may be used for young children as well. 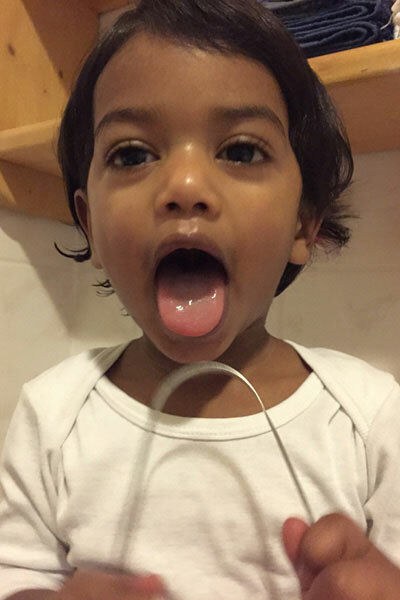 While older children can use the tongue cleaner by themselves with some practice, young children should get help from an adult who then gently runs the tongue cleaner over the tongue. For this, we suggest you use our sterling silver tongue cleaner, which is especially small, soft and round. The goal of all nutrition is to give our body, and thus every single cell, sufficient nourishment and energy. The requirement for that is to thoroughly digest the food. Here, according to Ayurveda, the digestive fire Agni comes into play. Only when it burns properly, are our cells well looked after and minimal waste material (Ama) is produced. Correspondingly, ayurvedic cuisine not only values a healthy and wholesome diet, but also various spices and other ingredients that stimulate the digestive fire. According to Ayurveda, they build the basis for good physical and mental performance and for preventing illnesses and everyday aches and pains. Otherwise, you may suffer from bloating, fatigue, skin blemishes, problems concentrating and other issues. By the way: The basic principles of ayurvedic cuisine resulting from this ayurvedic understanding apply to both children and adults. Stimulate all 6 senses with every meal by always introducing all 6 tastes (sweet, sour, salty, spicy, bitter, astringent). They all have different effects on a person’s body and mind. Always prepare your meals as fresh as possible. Not only is it healthier, it also simply tastes better. Have your child regularly drink warm water between meals. It makes the digestive tract stronger while a cold drink weakens it. In addition to the general information about ayurvedic nutrition, there are some characteristics that apply to children in particular. From an ayurvedic point of view, the Kapha dosha is dominant in the first years of a child’s life. That also explains their strong cravings for sweets. 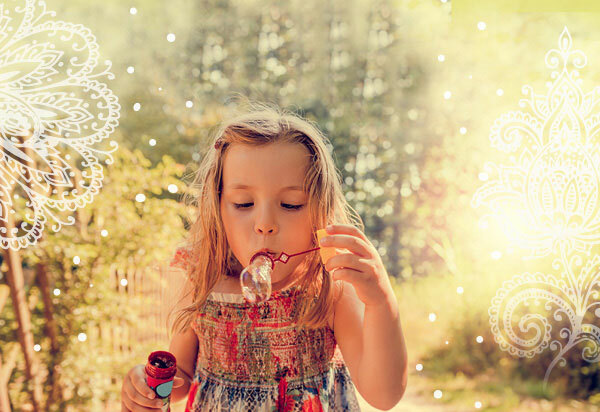 From an ayurvedic point of view, if you give a child a small amount of something sweet (e.g. a spoonful of apple sauce or some dessert) before the main meal, it activates the digestive fire and, thus, the nutrients of the meal will be better metabolised. If you like, and as is typical in our Western cultures, you can still eat a sweet dessert afterwards. However, sweet does not always have to mean unhealthy. A porridge prepared with ripe, sweet fruit is not only delicious and healthy, but also satisfies the need for something sweet. Do you remember this from your youth? In puberty, the craving for sweets is even stronger. Teenagers are in a transition period in which the whole body is busy. In this discovery phase, youth need something that gives them support and stabilises their Kapha dosha. This search for stability is also the reason why children can sometimes eat the same meal over and over again for a long time. Ghee is especially important for teenagers and children. It doesn’t matter whether you stir it into milk or cook with it often. Let your creativity run free! Anyone who wants improve their children’s diet – particularly at special stages of development – should maybe try our Children’s Rasayana. It is especially designed to meet the needs of children. Taking it is very simple: Half an hour before eating in the morning and evening, children 3 and older take 1 tablet with warm water or warm milk with candied sugar (if necessary, grind the tablet and candied sugar in a mortar). Also: specially adapted to the needs of learners, the “Student Rasayana” is recommended for pupils and students alike. To stimulate the “Agni” digestive fire in children, Ayurveda suggests warm porridge with some ground ginger, turmeric, cinnamon and a bit of cardamom. Children can have some spiced milk with that. Add some ghee and ground gingerinto a glass of milk. For children over 2 years of age, you can also refine the drink with some almond paste. In principle, Ayurveda suggest using cow’s milk because a vegan diet can lead to symptoms of deficiency in children, and a vitamin deficiency can, for example, lead to growth and developmental disorders. Dr. Jasmin Blumenberg: "Unfortunately, we see it time and again in hospitals that children who follow vegan diets exhibit bone growth disorders due to a lack of calcium, and deficiency symptoms in their development. Even in the first year, development can come to a stop, which then becomes difficult to compensate for." If you would like to make your own yoghurt at home, you can easily do so with a yoghurt maker, such as our Yoghurt Box. To relieve the bowel and allow your children to get a good night’s sleep, Ayurveda prefers light, easily digestible evening meals. Therefore, animal proteins, which are difficult to digest, should be avoided in that time. As already described above, you can passively do simple stretches with very young children during massages (legs over the head, hand to foot). 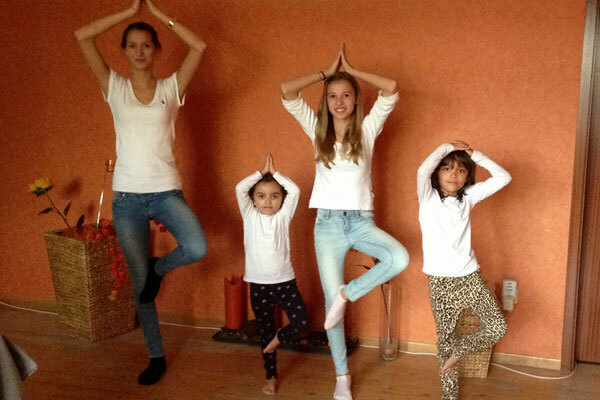 To support posture and balance, starting at the age of 3, children can practice poses such as the “tree”. The children stand on one leg, place the other foot on the knee of their standing leg and put their arms above their head. It’s fun! And moving is an important pillar in a child’s development. Especially today, when even young children extensively use smartphones and computers, it is especially important for your child’s development that you encourage movement (and moving outdoors in all types of weather). Join them! It’s not only good for you, but also makes it more exciting for the young ones. Dr. Jasmin Blumenberg: "Children often tell me that they play computer games after school to try to process the overload of daily stimuli, to which they are increasingly exposed in these modern times. Unfortunately, they don’t recognise that this leads to overstimulation again since computer games also provide stimulation. Then the stimuli increase and medical problems may very well arise. We see it again and again that children play all night long. In some cases, children then end up in hospital with seizures as a result of permanent overstimulation coupled with a lack of sleep. Therefore, it is important to help ease children into a good routine and rhythm in which rest, breathing exercise and children’s meditation also have their place." Gandharva Veda music, which is also used as music therapy, harmonises the doshas and is good for relaxation and inner peace, and not only for children. Precisely nowadays when many children are already under time and performance pressure, harmonising sounds can significantly contribute to relaxing both body and mind. That’s how they will find the peace they need to process the many daily stimuli. Dr. Jasmin Blumenberg: "We have had very good experiences in the clinic when we do massages on infants to the sound of Gandharva Veda music. When looking at the monitor recordings, we notice that the sounds lower the heart rate and slow down breathing, thereby reducing the Vata dosha." To start, we especially recommend the Rain Melody. It is suitable for every age and every time of day and is particularly used for restlessness. Did we give you new ideas that you would now like to apply? Then it’s best to start gently with individual steps that particularly interest you and that you can achieve bit by bit. Use our recommendations as a guide to show you the way, and then you can calmly find your own way. At every step, watch for what is good for you and your child and what makes you feel good. Just like children, be curious and open to new things without forcing it or overexerting yourself. This is how you and your child will benefit most. We thank Dr. Jasmin Blumenberg for her expert support and the wonderful pictures.